When I was in my 2nd year of college, I met this girl, in what you would otherwise call “gold rush”, which is where you scamper for fresh girls (mostly from the village) as soon as they report for their first year in campus (don’t look at me that way, am not a pedo, every body did it, and so did I – there is safety in numbers). She was a nice person, passive in nature – a replica of what the bible taught her, perfectly the way her culture expected her to be, her mother would be proud of how womanly her daughter had become. So I took time to examine this specimen that, whenever it came to making a decision, she could only say “Si ni vile unasema tu…” (while drawing a map with her right foot toe) loosely translated to mean, “Whatever you say, whatever you want, whatever you like… I will JUST DO IT”. Back to my people. Now, even when they have all information they need to make an informed decision, they would – still rather have someone else do the decision for them, be it their pastor, or husband, or village elder, and largely their politician. 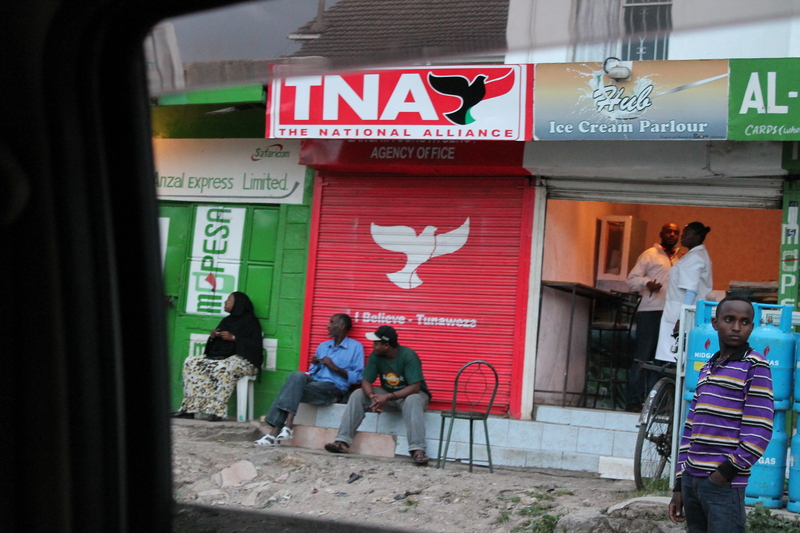 Young men chill outside a TNA office in Nairobi West shopping centre. Every campaign year, such offices are opened by the political parties as a PR gimmick to woe voters. They are not staffed, and often close a month of 2 after the elections are done. Sad that Kenyans never learn from these gimmicks.